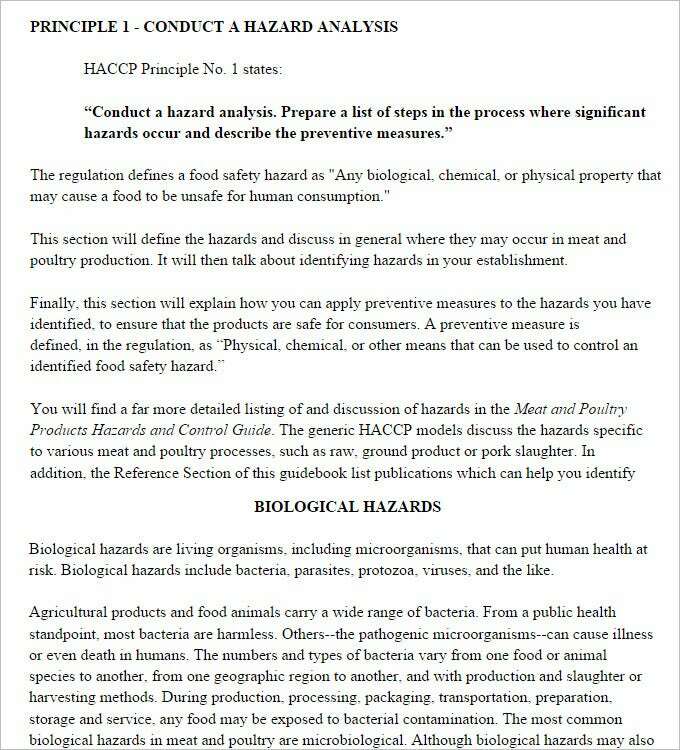 HACCP principle is a valid scientific practice regulating possible dangers in meat production prospects. It is also useful for Hazard Analysis and Critical Control point. The scheme of HACCP ascertains safe production of food products in varying markets. Its principles are applicable in the production, slaughter, and processing, shipping, distribution until home use. The top imperative facet of HACCP plan template principle is its scheme. 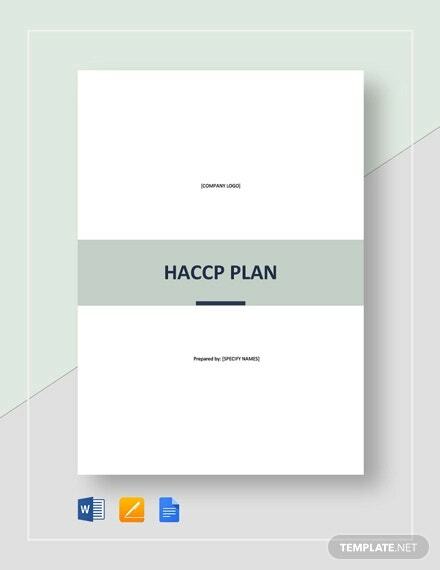 The HACCP plan template is not an inspection tool, rather a tool that helps with the preventive system of regulating food safety hazards. The approach of controlling a channel of production is noteworthy compared to inspecting the end product. Note that this is a science-based approach backed by scientific proofs. Hazard Analysis and Critical Control Point is tow components as you have noticed.You may also see Plan Templates. Principally, the HA, it symbolizes reasoning in the hazard analysis approach by pointing out how and where the dangers surface from. It is seconded by CCP control; it acts as the evidence of the control measure. Though the objective of HACCP principles is to ascertain product safety, it does not guarantee 100% food security to end-users. Its primary focus is three distinct hazards; chemical, physical and biological hazards, notably biological hazard. The reason is since biological hazard are often and their occurrence breeds severity. It consists of hazard from pathogens (bacteria, yeast and viruses). This is basically a template meant for recording data linked to the implementation of a food safety plan. Starting from the names of the team leaders who are responsible for carrying out the plan to what position they hold in the company, everything can be noted here. The fields provided in this Food Safety Plan Template are spacious enough to accommodate even lengthy details. 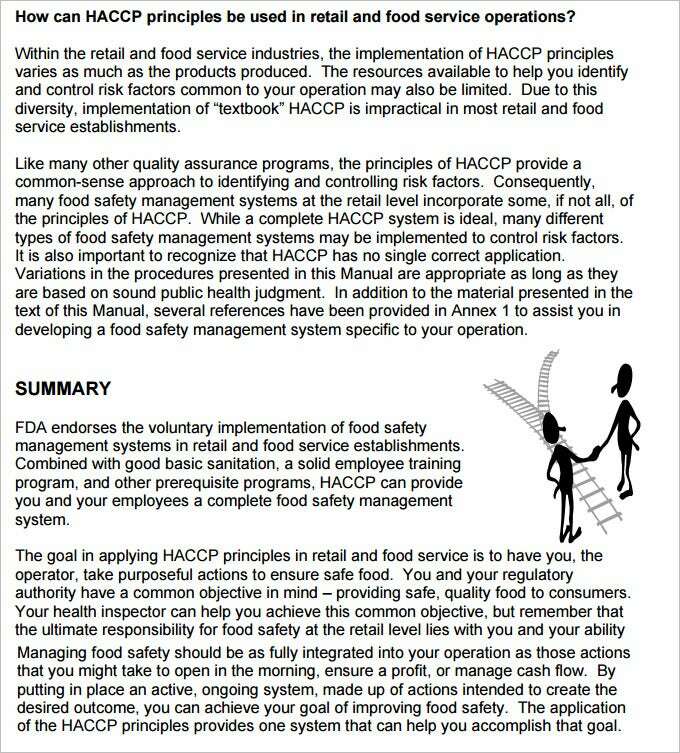 If you are not familiar with the principles of HACCP then this HACCP Principles Template is for you. It enlists the principles one by one and offers explanations against each of them. So, basically, this template can be employed by users as a source of HACCP related information. For people who are not aware, HACCP stands for Hazard Analysis Critical Control Point. It is, in essence, a methodical approach which is used to identify, assess and control hazards linked to food safety. If you are someone who is associated with HACCP in any manner, you may be in need of a HACCP-Plan-Template. 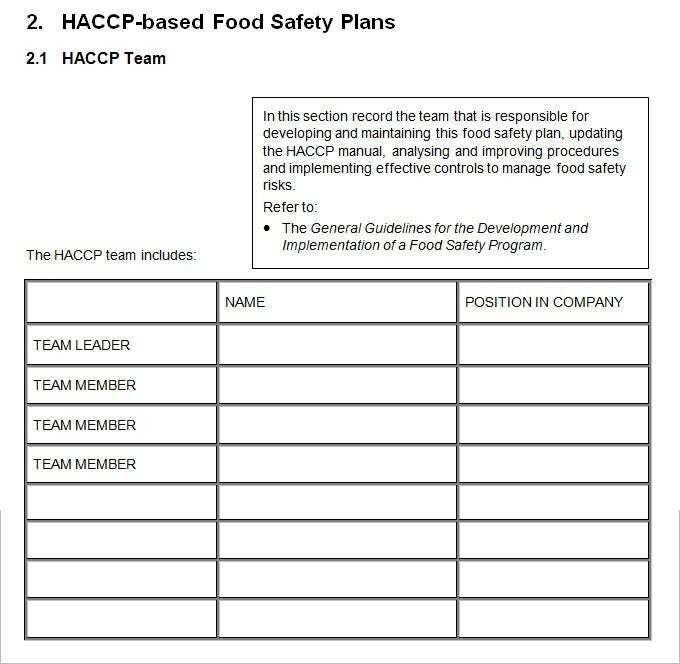 Most people, who have their job linked to HACCP, use these templates to aid their office work. This is an information heavy template. The template talks about how the principles of HACCP can be used in retail operations and other similar fields. There is a summary given at the lower half of the template, which saves you a lot of time. The use of illustrations has offered this HACCP Sample Template a dynamic touch. Any potential hazard in the production of food can not only be controlled but also prioritized with the help of HACCP. So, it basically controls and minimises food risks caused due to chemical or physical pollutants, microbes and other agents. So, if you own a food company then HACCP can help you assure your potentials and existing customers that all your food items are safe to consume. Without such an assurance, customers are not likely to have trust in the quality of your products. So, it indirectly boosts your products sale. You can learn more about HACCP plans by opting for a HACCP plan template. 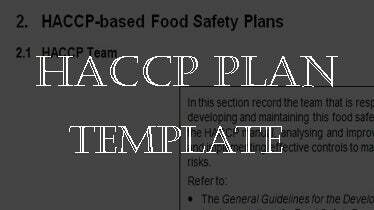 Avail these amazing HACCP- Plan-Templates free of cost over the internet. If you are finding it hard to locate them, you can make use of your internet search engine. Beware of unauthentic sources, though. The fact that they are so abundant makes it likely for you to fall prey to such snake oil sellers. And therefore, it’s always a better option to go for referrals. If you have any DMCA issues on this post, please contact us!